Philbrook brings a new, never-before-seen work by acclaimed American artist, Kehinde Wiley, into the Museum’s permanent collection. 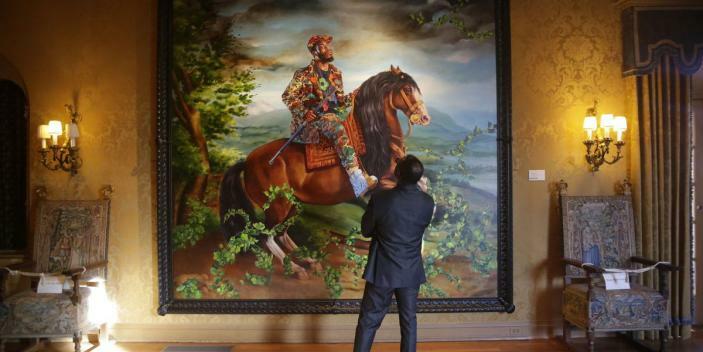 December 13, 2017 (Tulsa, Okla.) Philbrook Museum of Art recently acquired a new, never-before-seen work by acclaimed American artist, Kehinde Wiley. Installed today (12/13/17) in the “Italian Room” of the Museum’s historic Villa, the large-scale Equestrian Portrait of King Philip IV (114 x 118 inches) is the first Wiley work to be acquired by an Oklahoma museum. “Wiley’s work sits at the intersection of the past and the future, much like Philbrook itself,” commented Sienna Brown, Philbrook’s Nancy E. Meinig Curator of Modern and Contemporary Art. For most of Wiley’s career, he has created large, vibrant, highly patterned paintings of young African American men wearing the latest in hip hop street fashion. The theatrical poses and objects in the portraits are based on well-known images of powerful figures drawn from seventeenth- through nineteenth-century Western art. Pictorially, Wiley gives the authority of those historical sitters to his twenty-first-century subjects. Originally from Los Angeles, Wiley was influenced by the city’s theatricality and by visits to the Old Master-filled Huntington Art Collections. At twelve, he visited Russia on an arts fellowship. He honed his artistic craft earning his MFA at Yale in the 1990s, where he was steeped in the current discussions concerning identity politics. He brings these varied experiences to the multi- faceted, layered processes and themes of his work. Equestrian Portrait of Philip IV was begun in 2016 in the midst of Wiley’s popular retrospective, A New Republic. The exhibition opened at the Brooklyn Museum in 2015 and crisscrossed the country to six additional venues, ending at the Oklahoma City Museum of Art this past summer. Lately, the artist has turned his focus to the most important commission of his career: the official portrait of President Barack Obama. The portrait will be unveiled in spring 2018 at the Smithsonian’s National Portrait Gallery. Wiley’s paintings can be found in major museums such as the Metropolitan Museum of Art in New York, the Walker Arts Center in Minneapolis, and the High Museum of Art in Atlanta.